This is a mini review. I will try to restrain myself from crossing a certain word limit. 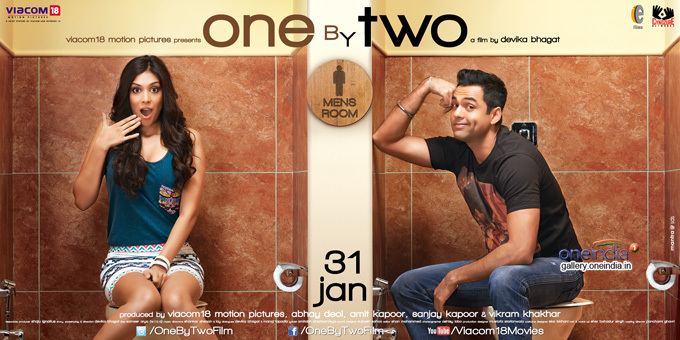 First off, One By Two is not a straight off rom-com. The plot has a continuous parallel approach where Abhay Deol’s Amit Sharma and Preeti Desai’s Samara Patel live their lives separately yet slightly connected. Both of them have a plush South Bombay family background and their needs are sufficiently met, yet they are going through a quarter life crisis. Amit hasn’t got over his girlfriend who has outrightly dumped him and publicly cheated on him. Samara won’t get seriously involved with her romantic partners. The plot devices used to form the seven degrees of separation are not exactly desperate, but not completely smart and subtle either. The songs transition into the narrative smoothly, yet test your patience with their generic textures. The soundtrack even has an Arijit Singh number, here’s me placing my ten bucks on he’s gonna be the next Rahat Fateh Ali Khan in the coming six months. I am Pakaao’d packs the most powerful punch. Darshan Jariwala as Amit’s uncle is appreciable in his parts, Agnihotri and Kriplani are fun, even though a bit stereotypical. One By Two is unconventional. I love unconventional. I don’t exactly love One By Two. I liked the effort, but the faults just kept haunting me.